Le Bleu Water is called “ultra pure” because it’s simply the purest, healthiest, and best-tasting bottled water around. In fact, we’ve won awards like the “BEST Non-Alcoholic Beverage in the Western Hemisphere” at the International Food and Beverage Trade Show in Miami, Florida. That’s similar to a Michelin Star for restaurant or a Wine Spectator award for wine. And here’s why: Our five-step purification process produces the highest quality bottled water on the market today. Imagine the cleanest, clearest mountain stream, so cool and refreshing you can scoop it up in your hands to drink. Doesn’t that sound enticing? But wait: That beautiful, seemingly pristine water may have disease causing microorganisms, minerals, or contamination from polluted rainwater. In our fractional vapor compression distillation process, we use drinking water from the municipal water supply and take it an extra “five steps beyond Mother Nature” before the water even enters the bottle, eliminating the contaminants. Water, the fluid of life and the shaper of the earth, is made from the simplest and most abundant element in the universe, hydrogen, joined to the vital gas oxygen. Two hydrogen atoms pair with a single oxygen atom to establish the triple structure water. In nature, water in its purest form is found in the water vapor that rises from the earth’s surface. Nature’s cleansing cycle consists of evaporation, condensation, and precipitation. As water evaporates from the earth, it leaves behind any contaminants it may have collected. Pure water, therefore, is a rare substance. Distillation is natures process whereby water is turned into steam, then directed into condensing coils where it condenses back into water. Steam distillation kills harmful bacteria and viruses, removes virtually all foreign particles, inorganic minerals, heavy metals, chlorine, and volatile organic chemicals (VOCs). Here’s how it works: Water is heated in a chamber and turned into vapor (steam). This water vapor rises leaving impurities behind in the boiling chamber. The purified vapor then enters a condenser, where it is cooled and returned to the liquid state. No other process produces purity as nature intended. That’s why we distill our water. You know that fresh, clean smell of the air after a lightening storm? It’s caused by the storm’s lightening bolts literally electrifying the oxygen molecules of the air, which results in the formation of ozone. It can also be created artificially in water by the use of high-voltage electricity, which is how Le Bleu generates ozone to remove all impurities from our ultra pure water. This process is called “corona discharge.” Ozone is the most powerful water sanitizer and disinfectant available. It purifies water much faster than chlorine, functions as a clarifying agent to “polish” the water molecules, improves the clarity and clearness of the water and is the most powerful and rapid-acting purifier available. Ozone kills bacteria, toxins, mold, yeast spores, organic material, parasites and even viruses. 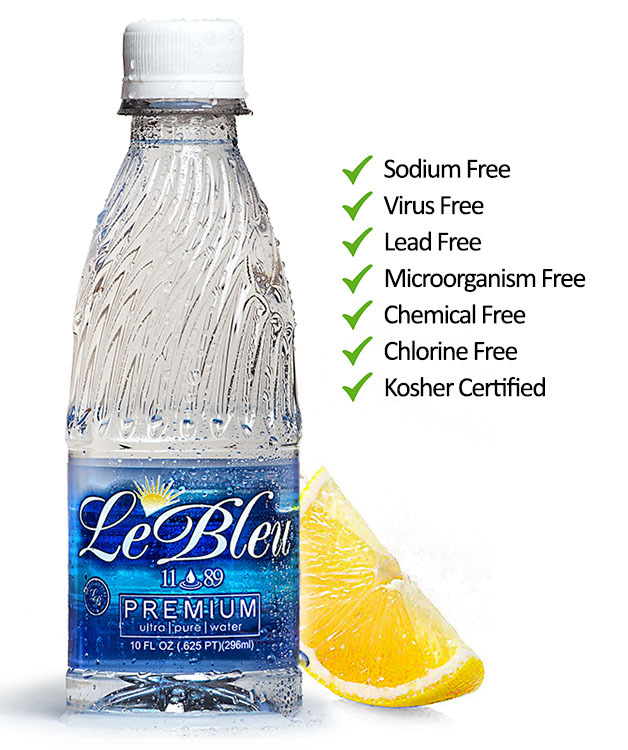 Le Bleu uses ozonation as just one step in our five-step purification process to provide you with the cleanest and safest bottled water possible. Compare Le Bleu’s taste and purity with any other bottled water and you make the choice. You’ll like what we do to it! Filtration, reverse osmosis, and other water purification methods don’t work nearly as well as our five-step purification process! Many commercially available water purification systems are based on the principle of filtration or reverse osmosis. 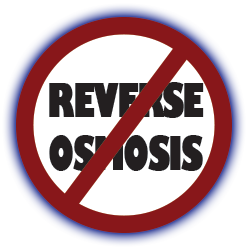 Reverse Osmosis (RO) systems force water under high pressure through a synthetic semi-permeable membrane to reduce inorganic minerals. These systems vary widely in their ability to reject nitrates, chlorides, and other contaminants. RO system performance is affected by water pressure, water temperature, pH, bacteria, dissolved solids and the chemical contaminant level of raw tap water. Like other filtration systems, gradual clogging of the system by collected contaminants will result in declining effectiveness and can also lead to contamination from bacterial growth. Also, water “treated” by reverse osmosis can have up to 90% wastewater and 10% product water.